The Veteran Beer Company launched its first two brews Thursday. The beers debuted only in Indiana, and in the state where the company is headquartered, Illinois. 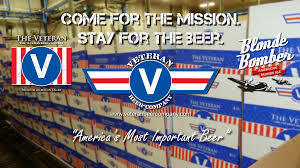 The Veteran Beer Company was founded by a veteran with a unique business model. Everyone working for Paul Jenkins served in the military. “Each of us has given something. In some cases, our friends gave it all. And so, I think that is essential. I mean there are not many people in the world who are willing to do that,” said Paul Jenkins, Founder, The Veteran Beer Company. Hoosier native Bennie Fugate spent 28 months serving in the middle east. During that time, he was badly injured. Now, he’s labeled as a disabled vet. Before landing a job with Veterans Beer Company he was having trouble finding work. “I’m on over 10 medications but you know what I’d do it all over,” said Bennie Fugate, Employee, Veteran Beer Company. The employees say there’s a sense of brotherhood within the company, that they felt while serving in the military, and it helps them as they continue to adjust to civilian life.